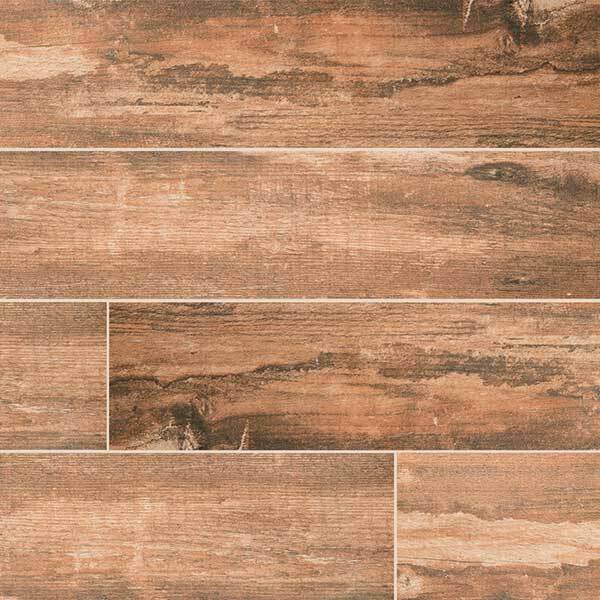 Salvage Red 6x40 Glazed and Matte finish Porcelain large planks. SOLD BY BOX OF 8 TILES = 13.36 SQ FT.
Salvage Red 6 in. x 40 in. Porcelain Tile features a creative blend of understated reds that replicate the knots, grain and texture of reclaimed hardwood. This wood look porcelain plank adds a touch of charm to a wide array of projects, including floors, accent walls and countertops throughout the home. It’s ideal for damp spaces like bathrooms, kitchens and foyers - where the look of hardwood is desired, but the durability and low maintenance of porcelain is preferred. Strong and beautiful, it’s also a great choice for a variety of light commercial environments. Tile that looks like wood is very popular and this one is no exception.